Recently, our own Michael Maxwell utilized Zamurai, our App of the Week a couple weeks back, to create a professional network topography diagram on the fly. 3n1media was in the process of building out a technology infrastructure for a client's new office, and our systems engineers needed to visualize the new network before installing its components. 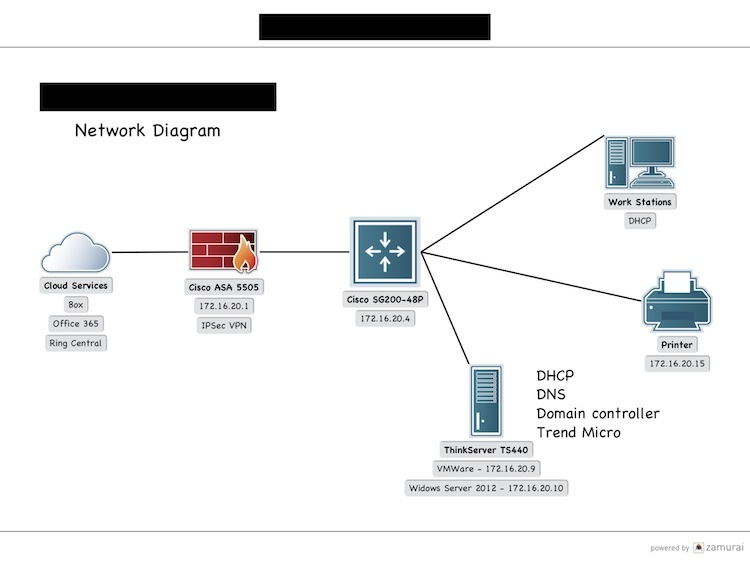 Michael was able to use his iPad to create the network diagram you see pictured to the left in under 10 minutes--a process that would have taken longer in the more expensive (albeit more robust) Microsoft Visio desktop program. Again, this is a great example of how tablets do indeed facilitate real work when business users employ the right apps. And, even more than that, it shows how tablet apps can help users go beyond desktop functionality in certain instances. Stay tuned to the blog for more on great business apps and practical examples of how they can help you get work done!